By Catherine Hakim, Karen Bradley, Emily Price and Louisa Mitchell for Policy Exchange. Published in London in January 2008. 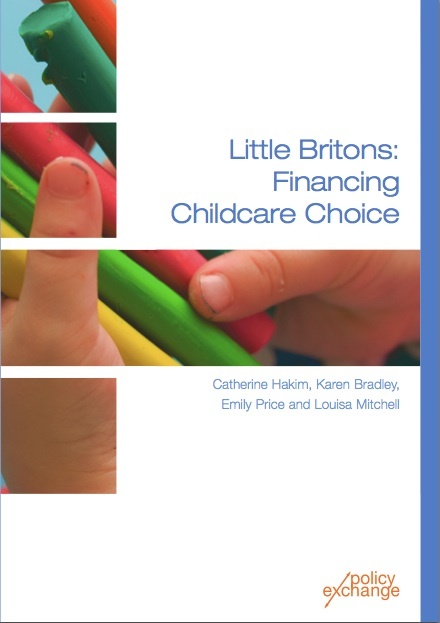 An assessment of existing research on parental preferences and a review of how state childcare is funded, how it supports individual families and its impact on the private and voluntary sectors. The report establishes that present arrangements, although a great improvement on the past, are not flexible enough to meet the needs of today’s varied family structures and working hours and are expensive. Proposals are made for ways to improve the flexibility and affordability of childcare during the first three years of a child’s life, when childcare requirements are the most intensive.